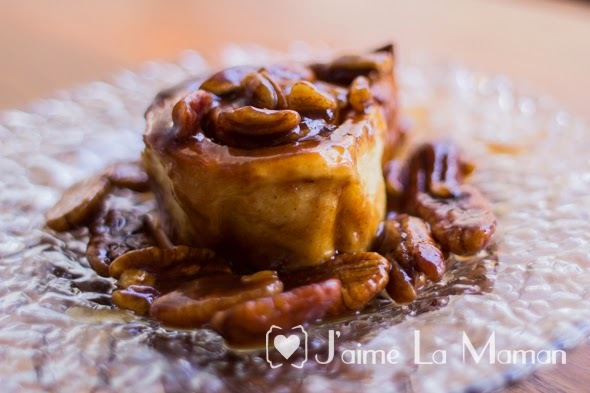 "Oh J'aime lets make sticky buns for the Saturday morning Baby Brunch!" my mother said, there was only one problem. 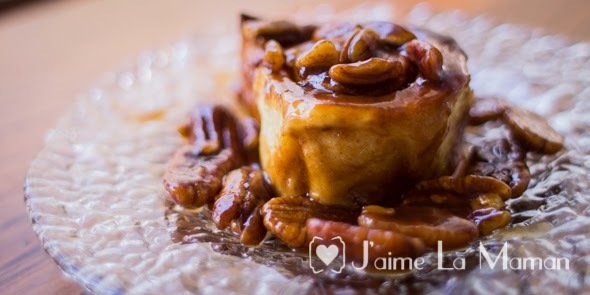 I didn't know what a sticky bun WAS much less how to make one. 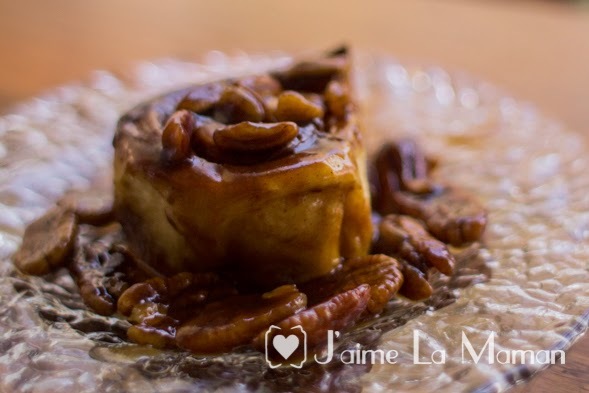 "What IS a sticky bun and why would I make it?" 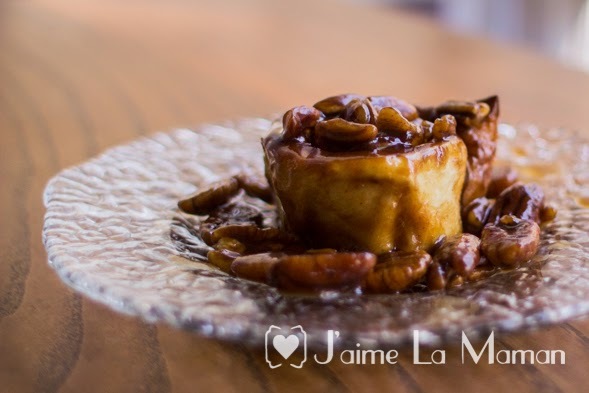 "Well, its just like a cinnamon roll but you bake it in a sweet sauce so when they come out of the oven you can just flip the pan over and you don't have to top them with a separate frosting"
And off we went to find the perfect sticky bun recipe. Even better, the sticky buns were easy to make the night before and just pop in the oven the morning of brunch so we didn't have to spend hours the morning of kneading and waiting for dough to rise. They were PERFECT and obviously the taste was OUT. OF. THIS. WORLD. If a better brunch food exists I haven't found it. 1 cup pecans, half whole, half chopped. Start the day before you plan to serve the rolls (up to 36 hrs prior to serving). 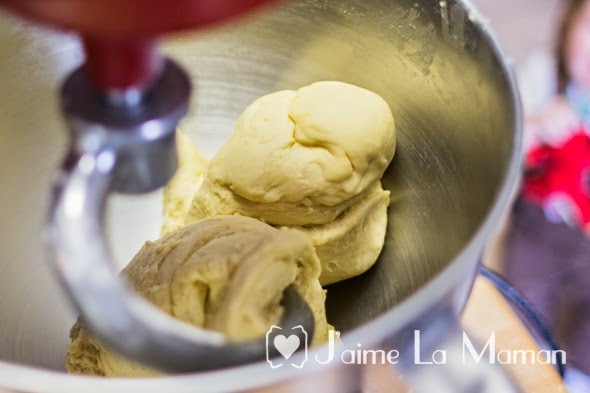 Begin by "proofing" your yeast, which can be done right in the bowl of your stand mixer (or mixing bowl or bread machine) this is where you slowly hydrate it to make the dormant yeast start to wake up before mixing it into the rest of your dough. We do this by taking warm water (between 105F and 120F) and mixing a bit of sugar (the yeast's FAVORITE food) about 1 tbsp, and then gently sprinkling the packet of yeast right on top. You don't want to stir the yeast in, not that it will really make a difference one way or another, but the sudden change might shock them a bit. You also don't want your water too hot which would kill the yeast or too cold which wouldn't wake them up enough. Once the yeast gets nice and foamy you can begin adding the rest of your ingredients. 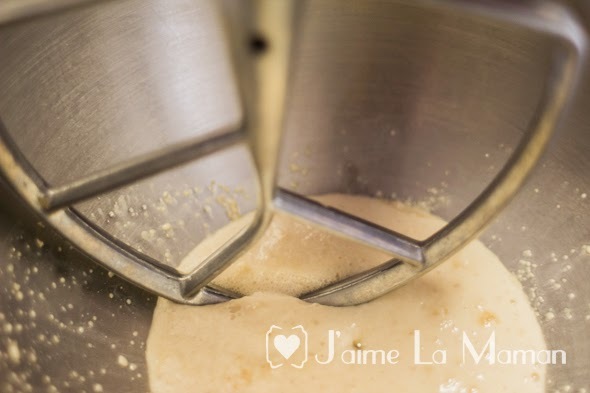 With the beater blade on your mixer next add in the rest of your ingredients, reserving about 3 cups of flour. This allows all your main ingredients to get mixed up while the mixture is still fairly wet and easy to mix. 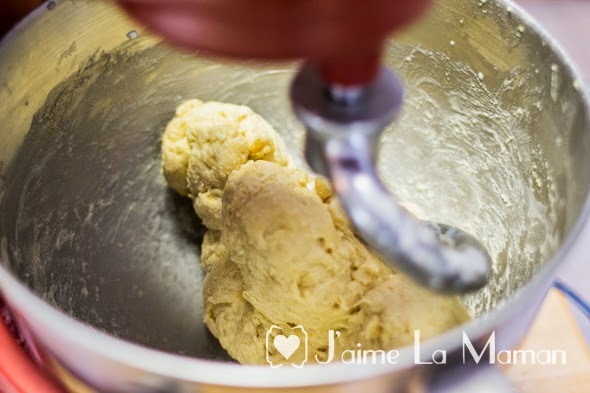 Finally switch over to your dough hook and slowly add in the rest of your flour while kneading the dough. Once all the flour is in, continue to knead for about 10-15 minutes or so or until the dough is smooth and shiny and easily cleans the sides of the mixing bowl. Grease a medium bowl with plenty of butter, then drop the dough ball into the bowl and allow to proof in a warm moist place for about an hour (an oven at 100F, or a warm cabinet). 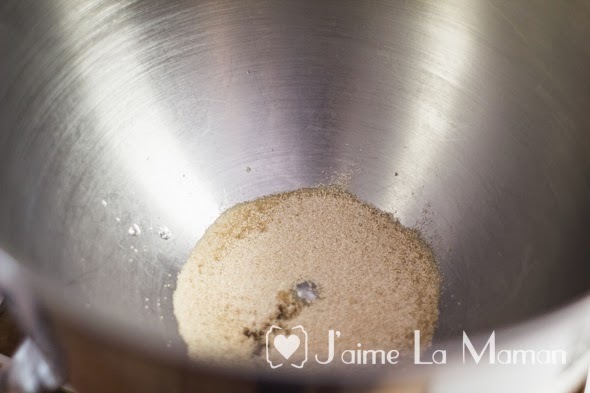 Once dough has doubled in size remove it from the bowl and drop it onto a lightly floured surface. 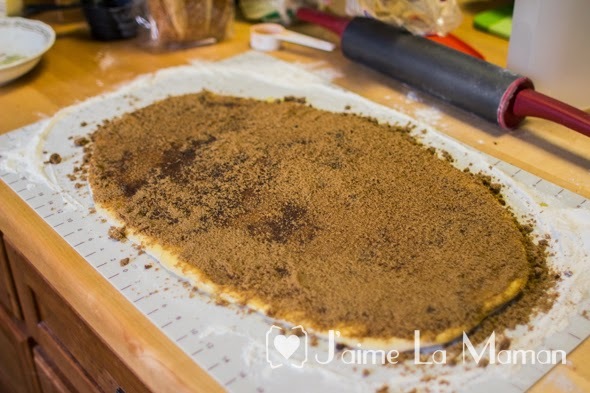 Roll the rectangle starting on the LONG side so you end up with a very LONG cinnamon roll. Set roll aside and make goo. Begin by heating up the unsalted butter in a medium saucepan over medium heat until melted and bubbling. Add sugar while whisking constantly. Add remaining goo ingredients and continue whisking until well blended and consistent in texture. The next morning remove the buns from the oven as soon as you get up. Its ideal to let them come up to room temp for an hour or so but you can bake them in as soon as 15 min after removing from the refrigerator. Preheat the oven to 350F, once preheated place the buns in the oven, the goo on the bottom tends to prevent the buns from cooking on the bottom at the same rate they do on the top so its helpful to put some aluminum foil over the top of the buns. Check on them in about 30 min, remove when fully cooked through which for me took up to 45 min on one tray but was as little as 30 min on another. Once cooked remove from oven and immediately turn the tray upside down over a serving platter, ladle reserved goo onto the top of the warm rolls.